I like to eat healthy, it’s important to me. But I love treats. I love carbs. I loveeeee things that are sinfully delicious. 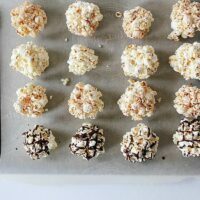 These 3 ingredient popcorn balls are no exception!! I know I called them 3 ingredient popcorn balls, but technically the base recipe is 2 ingredients, with customizable options. Who doesn’t like customized treats? Really stir in that honey, it takes a bit of work to get all mixed up, but it’s important to get it mixed or else it won’t stick together! Let the honey cool a bit if it’s too sticky when you try to form it into balls. Use your imagination. There are TONS of flavour options out there, I’ve given a few but don’t feel limited to what I made, I gotta hear what you came up with too, so please share! Love popcorn? Try my Healthy Caramel Popcorn too! Place popped popcorn in large bowl and set aside. Prepare baking sheet with parchment paper. Heat honey over medium high heat until it simmers. Allow it to simmer for a few minutes, while stirring occasionally. Drizzle honey over popcorn and toss to coat completely. It's a little bit of work. Use a large ice cream scoop or your hands to form into balls - if it seems too sticky, let it cool a bit more. You'll have to mash them together a bit to get them to stick. Place formed balls on prepared baking sheet to cool completely. Sprinkle salt, cinnamon, or cayenne powder on the popcorn balls if desired! I melted 1/8 cup Enjoy Life chocolate chips with a pinch of coconut oil and drizzled over top of my chocolate drizzle ones! 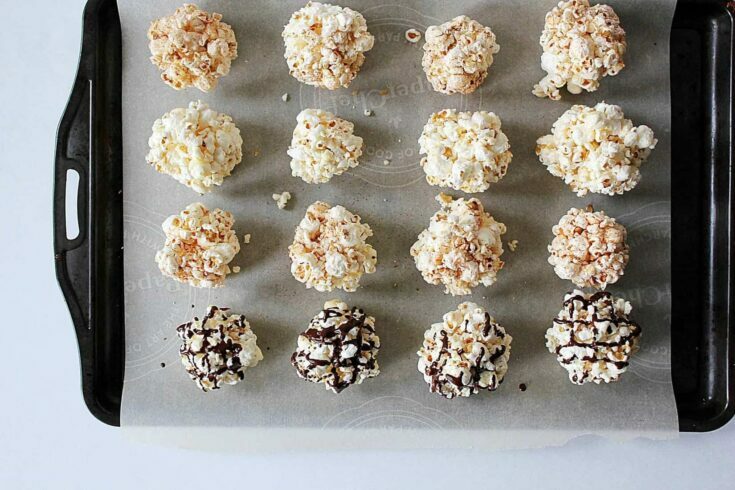 PIN 3 INGREDIENT POPCORN BALLS RECIPE FOR LATER!